OK—enough I say. It’s 2:37 pm on a Monday afternoon, January 14th to be exact, and it’s only 6 degrees. Actually my outdoor thermometer had been registering the below -0- F mark most all day and in keeping with that thought, my refrigerator was sort of empty and extra cold as well. 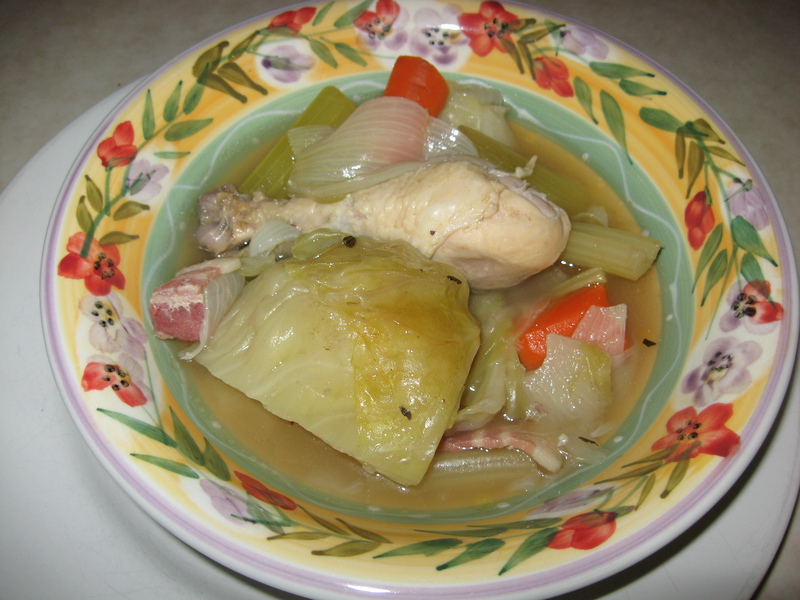 In it I had 6 partially still frozen chicken legs, a head of green cabbage, some celery, and 2 carrots. Oh my-not very appetizing. On the counter top, I had one onion and one head of garlic. Yes indeed like Mother Hubbard, my cupboards were bare. I was up for the challenge mainly because I didn’t feel like braving the cold outdoors; I was shivering, even indoors; so what to make to warm myself with my few at home ingredients? : soup of course—including the special ingredients that I do keep in my freezer such as a stash of herbs as well as cilantro and parsley. So, I used those, but if I hadn’t them, I would have used my dried variety(substitution mix is usually 1 Tblsp. of fresh equating to 1 Tsp. dried). This clear and delicate tasting soup actually turned out so nice that I wanted to share it and my lovely creative experience with you. In a tallish pot, place enough water to cover the chicken and veggies-that’ll probably be a couple of quarts or more. Bring water to boil. Throw everything in that water except for the green cabbage and potatoes. Bring back to a boil and then turn to simmer. Simmer for half hour. Add the cabbage and the optional potatoes and bring back to a simmer for another half hour. I didn’t feel like potatoes, so I made myself some noodles. Boy my soup warmed me up immediately. Additionally, I enjoyed the light and fresh taste of the seasonings that I had randomly chosen for the broth. Finally, the challenge of using the few ingredients that I had in my space kept me on my toes on a freezing cold day and gave me a creative challenge and an ending satisfaction. So, that’s what I really wanted to share with you because you too can do this or maybe something even better. If so, email the Sun with your unplanned and sudden creative dish. Don’t be shy!! !